Before you think about obtaining a price for a basement renovation project a sketch or a plan is required. Of course, it is possible to obtain an approximate budget price in renovation but it is always better to take a few minutes to draw at least one sketch with the dimensions of the rooms with a specification stating the list of the works to be done which will help the contractor to specify the price. The Basement Renovation Group helps you first to make the sketches and the plan as well as the specifications with a list of the renovation works and then it helps you to obtain several prices from licensed member contractors of our Group. If it is simply to add a bathroom or a bedroom in the basement it is not necessary to make a sketch or a plan. 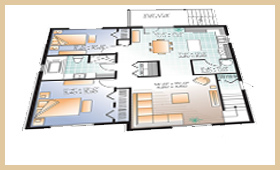 However, if it is to develop a complete basement involving significant investment and several rooms and construction details such as a family room with bathroom, laundry room, home theater, a rental Bachelor apartment or a professional office, then a sketch and an overall plan with dimensions are recommended. Even if you do not have the plans of the existing house, only a few minutes will be enough to take the dimensions of the basement and make a sketch or a plan with the computer. This plan will serve for the estimate and will be an element that can be attached to the contract. In addition, the plan will of course be used to apply for a renovation permit at the municipality. If the basement renovation project requires an interior designer he will take care of making the sketch & the plan and even prepare 3D color renderings to better visualize the entire project plan before you begin. The renovation of the basement is done turnkey using the plan. The basement is transformed in a few days’ time only into the family room you have dreamed about.